As a Mold Inspector in the Cleveland area Rick Nesselhauf, owner of Dutch’s Mold Inspections, has many connections with Cleveland area Realtors. 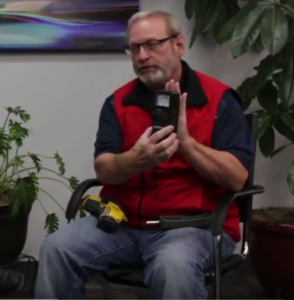 In this video Rick explains the prevalence of mold, his mold inspection tools and when mold can be a serious issue to the health of the home’s inhabitants or in a real estate transaction. Although the “smell test” isn’t exactly a scientific method taught by the EPA or Indoor Air Quality Association (IAQA), after decades in the industry Rick explains that his experience in dealing with mold in distressed homes gives him the confidence to identify when he smells mold. When you can see mold there isn’t likely a reason to subject the home owner to more costly steps for testing for mold. Dutch’s Mold Inspections will then take a sample to identify what type of mold it is, however when the mold is clearly identified you will want to move into remediation, or mold removal, and identify its cause in order to keep it from reoccurring. The swab test, as Rick explains, is a Q-tip type swab that is used to take samples from the affected area and send to a mold testing laboratory to find out if it is mold and what type of mold it is. The air cassette method is to test for mold spores in the air. It is provided by the mold testing laboratory, used to collect air samples from the area and send back to the lab in order to look under the microscope, see not only what type of mold is in the air but also the consistency, or how much mold per area. The lift tape is pressed down on top of suspect mold and sent to the laboratory to see what type of mold it is and if the case of carpet or furniture, if the items can be safely sanitized and kept or if they should be thrown-out. Rick explains how this moisture meter can be used on drywall, studs and even concrete to detect moisture consistencies in the wall and compare to other areas. Critical to finding hidden mold and wet areas within, or behind, walls and floors. The professional grade moisture meters used by Rick and his team give exact and detailed information about the scale and severity of moisture pockets, which allow potential mold growth, allowing for much narrower and more effective mold remediation to take place. The Thermo-Hygrometer is used to measure temperature and humidity – two important factors for an environment conducive to mold growth and colonization. By checking the humidity in different rooms and floors in the house it becomes a process to determine proper airflow, ventilation and areas that may be trapping to much moisture in the air.